Damnit. Prince. Not you, too. I’m still not over Bowie or Robin Williams, or even Michael Jackson for that matter. And I still miss Fred Astaire. I have a tendency to hold on to things, like those four vinyl albums in the picture. I used to have 1999 too, but it was warped, and I had to throw it away. In addition to listening to all the Prince I own in every format for the past few days, I was lucky enough to get to see one of the showings of Purple Rain in the theatre on Saturday. It was transformative. People of all colors and orientation gathered simply for a musical genius who embodied creative sexual energy that transcends gender. It still does. I had recently come to appreciate his insanely exquisite guitar riffs, but I don’t think I ever quite appreciated the full genius of his creativity until Saturday. In honoring his talents and gifts and making his own rules, he gave us the opportunity to be better and to break out using whatever creative energy we’ve got. What a gift. When I first heard the news, I texted my friend Sonia, my U2 mate, because we also bonded over Prince, especially Purple Rain. We’ll no doubt be awash in musicians’ tributes and Purpleness for days to come, and that’s all right. Me? I’m going to dance like there’s no tomorrow. This entry was posted in Boston, dancing, family, Friends, Looking back, Mid-Life, Musings and tagged 1999, creative genius, creative sexual energy, Just want to be your lover, Lets go crazy, Prince, Purple Rain on April 25, 2016 by sdeden. It’s that time again in Boston when we celebrate the Revolutionary War battles of Lexington and Concord so we can watch the Boston Marathon. For me, each year that passes lessens the hurt of the bombings and deepens my appreciation for the runners, who I used to think were crazy for running 26 miles. I still kinda do, but I have come to be thankful for people who run to meet a goal of mileage, fundraising, or both. People who run with passion and purpose. People who run to remember and people who run to forget. People who run toward the wounded. People who run in spite of everything. People who run. Thank you –we’re rooting for every single one of you. Photo credit: Running Past . How amazing is this? This is Japan’s Shigeki Tanaka winning the 1951 Boston Marathon in 2:27:45. He was 19 and a survivor of the Hiroshima bombing. Thank you, Mr. Tanaka. You can see more great old photos of the Boston Marathon on the Running Past website. This entry was posted in Boston, Looking back, Mid-Life, Musings and tagged Boston Marathon, Boston Strong, Patriot's Day, Runners on April 18, 2016 by sdeden. I’ve been working 15 days straight, and am on day 10 of a big IT go-live. I know, I know, boo hoo, cry me a river. Lots of people work more for longer periods of time, and I salute all of you. I only mention it to say I haven’t a scrap of brain cell left to write a decent blog, so you’re getting a cute hamster instead. 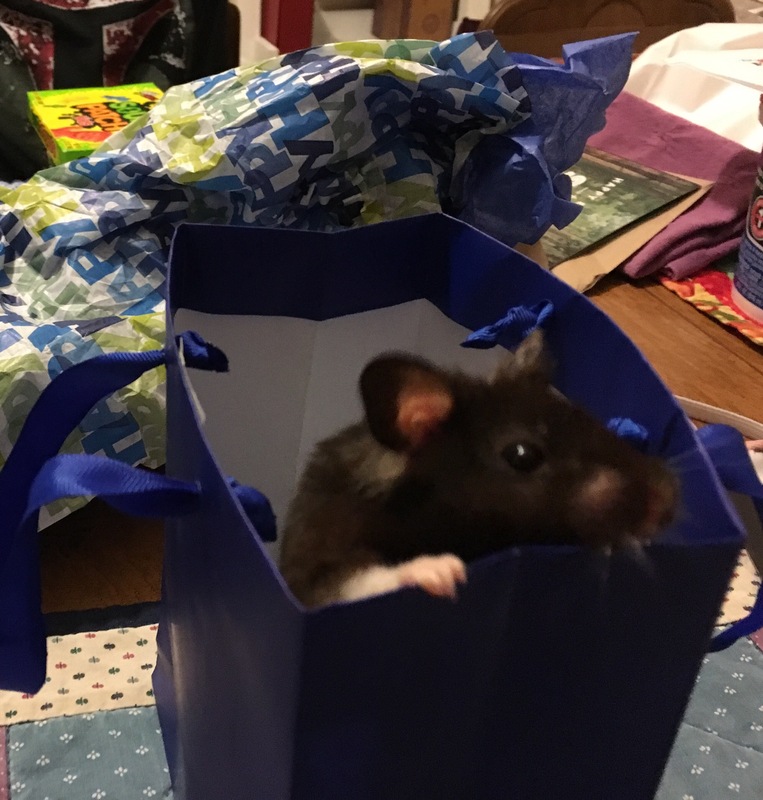 Marble will entertain you today by poking his head out of a bag. He is also helping increase the numbers of hamsters on the Internet, of which there are too many cats and dogs. So enjoy, and maybe I’ll get brain cells for next week. Or maybe you’ll get hamster pictures. Cheers! This entry was posted in Mid-Life, Musings, work and tagged hamster, no time off, working on April 11, 2016 by sdeden. I worked all weekend at my usual Monday through Friday job (I know, I know, cry me a river, wah, wah, wah). I only mention it because I had thought I was prepared to still post whilst I was working my behind off (don’t you just love that British word, whilst? It’s the ultimate in word economy). But it turns out polishing a rough draft is still more than I can manage when I have to work all weekend. So instead of a crappy, unpolished blog about farting–I bet you can’t wait for that one, can you?–I present to you fabulous closure to my post about protecting my hearing while I’m dancing. For those of you who missed it: I go dancing a lot. The music is loud. My ears ring. I got my hearing tested so I could get musician grade earplugs. An adorable young audiologist tested me and gave me pamphlets to give to my “loved ones” about hearing loss. Hilarity ensured. But none of that matters. What was really important was getting those coveted musician grade ear plugs. And the key here is “musician,” because it turns out musicians require colorful materials for their ear plugs. The choices were overwhelming, but in the end, for this disco queen, there was only one choice. Gold glitter ear plugs. I’ll see you on the dance floor. This entry was posted in dancing, Mid-Life, Musings, work and tagged Dancing, disco, glitter, musician ear plugs, Westone on April 4, 2016 by sdeden.